Back in February I applied to the program, “Pueblo Inglés” as an English speaking volunteer to aid Spaniards in their English language fluency. The program is run through the language company, Diverbo in Madrid. I had heard of the opportunity from my father who’s friend had participated several years prior. I later learned that word of mouth is actually the primary source of volunteers for the program, so much so that the company needn’t advertise. The program is currently in Spain and Germany and involves native English speakers volunteering their time in return for room and board for a week in Spain (or Germany). The only requirements to volunteer are that English be your first language and the promise to speak all day long for a week in English (no attempts to better your Spanish, or impress with your knowledge of other languages). This may seem easy, if you come from an English speaking country, you’ve already won half the battle. I will tell you though, that mental exhaustion is inevitable, when speaking for 100 hours over the course of eight days, with people you may not have much in common with and having to reintroduce yourself twenty-five different times. I will also tell you that it is completely worth it and I would absolutely do it again. 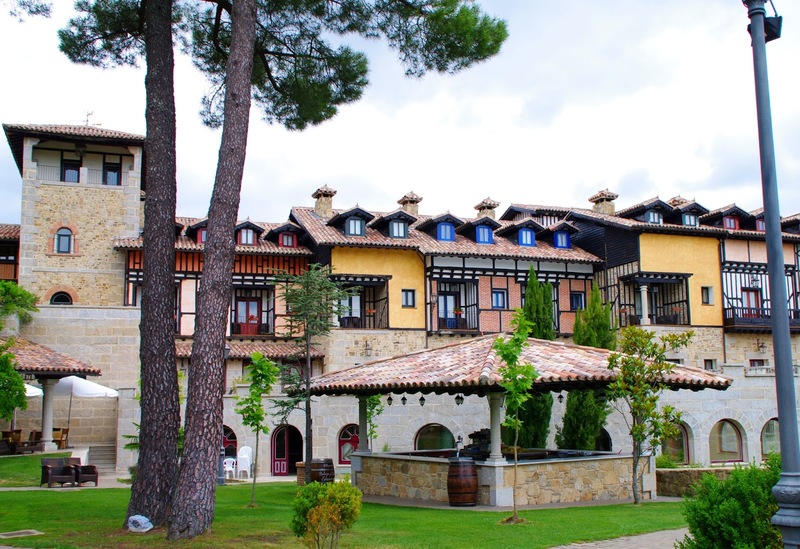 Though there are several different locations in Spain, I applied to the program in the province of Salamanca, just outside of the small village of La Alberca (approximately a four hour bus ride outside of Madrid). The program is always set in a remote location in order to prevent any interference of Spanish speaking, as it is an English immersion program. The Spaniards must all pass an interview and all have had previous lessons in English grammar and vocabulary and so this week is about fluency and speaking in a more natural setting than what you learn in the classroom. Coming from Canada and having taken French immersion in school I can completely understand the value of the program. While I took eleven years of French immersion and can read, conjugate verbs and speak French, my ability to have a causal conversation is limited as the way you learn a language in a classroom is completely different from the way native speakers use a language in a relaxed environment. The program is very structured and both volunteers and Spaniards have very little free time during the eight days. Even though I was volunteering, it never felt like work. I had such an amazing week and actually felt like a kid at summer camp most of the time. The program has been running for quite some time and as one of the moderators mentioned at the beginning, they have adjusted the program over the years and have come to find what works and what doesn’t, in terms of activities, length of program, structure etc. Which I have to agree with, I think it is an excellent program, and though I can’t speak for the Spaniards in terms of how much they’ve learned (other than knowing several returned and anecdotal evidence), as a volunteer I can definitely say I would recommend the program, and can’t speak highly enough about it. I met so many wonderful people from Australia, England, St. Martins, Spain and the United State of America. I was actually the only Canadian volunteer and was amazed to learn from almost every Spaniard that my accent was the most difficult to understand. The Canadian accent (I have lived most of my life within a two hour radius of Toronto) being one of the most neutral accents the world over I was amazed to hear this. I first learned this when sitting down for lunch on the first day and having a conversation with an Australian and two Spaniards. I exclaimed, “I don’t consider myself to be a fast talker”. To which one of the Spaniards, who happened to be my roommate for the week replied, “I spoke with four Anglos on the bus, all of whom I understood, but I can’t understand you”. We were all paired up two to a villa, one Spaniard and one Anglo. We were paired up according to gender and age. The villas were nice, though we were kept so busy at the program, we didn’t spend much time there unless we were sleeping. I got on really well with my roommate. In fact, I got on really well with everyone at the program. I was actually shocked at how well everyone got along together. Though I suppose if you’re not an easy going person, you’re not likely to volunteer your time as a speaker for an immersion program. The average day looked something like this: breakfast was at 9am and lasted about fifty minutes, with a ten minute break following most activities to allow for a mental break etc. Each meal occurred in the dinning room at a table of four: two Spaniards sat across from each other and two Anglos sat across from each other. Following breakfast we would have a series of three “one to ones” involving the pairing of an Anglo and a Spaniard who would spend the next fifty minutes talking. We could go for a walk around the premise, or to the hotel for a coffee, whatever we liked, but we had to speak English to each other for a full fifty minutes. This can sometimes be very unnatural, as rarely does one meet a stranger whom they may have little in common with and speak to them for a full fifty minutes, let alone doing this three times in a row, a total of five times a day, for eight days in a row. That being said, everyone has something they can find common ground with and it’s always nice to talk about something you know nothing about as this is how we learn and grow as people. I think it’s also a good exercise as it makes one more personable and helps your social confidence. I learned so much about Spain and different cities, as well about people and even myself! Following one to one’s we would have “two to two’s” where we would be paired up by the moderators (two Anglo’s, two Spaniards) and given a list of topics to discuss. The discussion was allowed to stray (and often would) from the given topics, but they served as a jumping off point. These again lasted fifty minutes. Next was lunch time, we would have a choice the day prior to choose one of two appetizers and main courses. We were so well fed I often just chose one of the two, as the appetizer was often just as large as the main course. We were also served desert at both lunch and dinner. I had the opportunity to try a few Spanish dishes, including paella, which is delicious by the way, kind of like risotto. I also learned, first hand I might add, that the fish in Spain is not as processed as it is in North America, leading to me very awkwardly and rudely, removing fish bones from my mouth at the dinner table. Eventually one of the moderators, a Spaniard, kindly showed me how to dissect my fish to avoid the bones, it’s still work in process for me. I also had a difficult time adjusting to the coffee custom. As a North American coffee is a very relaxing time for me. I like a big cup of coffee, which I sip for an hour while I read, or chat with a friend. It’s an escape for me, when I don’t have to worry and it’s important to me. However, at the end of meals we were all served tea or coffee, and by coffee I mean a shot of espresso, which the Spaniards all shot back and were ready to go, while I was sat there sipping away. Following lunch was siesta, a three hour break wherein we could relax and do what we please. While it’s recommended that one nap as the day can be quite long, a nap isn’t mandatory. Never having been one for naps, I usually wandered around the beautiful premise of the hotel and snapped pictures, or stayed in the common area chatting, or catching up on social media and emails. We had two more one to one’s following Siesta and then a group activity. Group activities would often involve small group projects which would be presented at the end of the activity. These were reminiscent of grade school group projects. I believe there would be another one to one next and then back to the activity room for theatre, or presentations. I didn’t personally present anything, or take part in theatre, but the presentations were all informative and theatre was very entertaining and always a good laugh. Dinner took place at 8pm! Very late for Anglos, who typically eat at 6pm and early for Spaniards who might not have dinner until 9pm or 10pm. After dinner we were encouraged to hang out in the bar/common area and most nights we did until we were kicked out at closing. The night would often end with those who could play instruments leading a campfire style sing along. I will have more posts about specifics of my experience at Pueblo Inglés, but most days followed a similar schedule. I had a really amazing time that week and I will always remember both my experience and the people I met, whom I hope to see again, wherever in the world we might be!